How Did I Get On This List? « How Do You Measure 525600 Minutes? Home » Uncategorized » How Did I Get On This List? How Did I Get On This List? For about eight months now, I’ve been getting at least one email a week from the Obama campaign (this week I got three). I’ve been invited to dinner, to volunteer and of course, to donate money. I’ve gotten emails from campaign staff, Barack, Michelle, Joe… and a few days ago, Jill Biden invited me to sign Michelle’s birthday card (and while I’m at it– make a donation). After all this time I still can’t figure out how I got on this email list. I did support the President in the last election but I have not even begun to make up my mind regarding who I’ll support this year. I’ve always thought it would be exciting to be be a part of a campaign but I’d have to believe in the candidate 100% in order to do so. Quite honestly, I hate politics. The whole game gives me a headache and usually I find myself voting for the lesser of two (or more) evils as opposed to voting for a candidate I truly believe in. I know politics is supposed to be a taboo subject in certain gatherings, especially family– and in my family, we are on opposite sides of the spectrum. Yes, I’ve had my fun getting my Dad riled up about a politician or issue but after a while, maybe it comes with maturity, I’ve found it much more productive to try and find our common ground. My parents are what I would consider, religious right Republicans and they probably consider me to be a far left wing Democrat. In reality, I’m probably right in the middle. I’ve found the best thing about our discussions (finding the common ground) is that I actually hear more of the true issues and reasons my parents vote the way they do, than when we are discussing the politicians. If we avoid the politicians, we can have an intelligent, bonding conversation about the needs and future of our country. I really have a low tolerance for negative campaigns and mud slinging. I also despise campaign promises that are so grand they can never be accomplished. In my view, the presidential race is about selecting a figure head who can instill pride and confidence in the American people. Their platform comes in a distance second. I don’t believe the President has nearly the power to evoke change that many believe they do. They have to get bills through congress and by the time they are done– it is either so watered down or has so many other considerations attached to it… it’s unrecognizable and usually does more harm than good. So back to the campaign emails… You know what has been missing from these emails? A platform. You would think in at least one of the more than 30 emails I’ve received, at least one would actually inform me about the candidate. Yes, health care reform has been mentioned… but what does that mean? How will it be executed and financially be controlled? What are it’s implications for our national welfare? How will it impact me directly? Doesn’t it make as much sense to share the vision as it does to beg for help? I might be more likely to contribute or volunteer if I know what I’m supporting. I’ve been trying to formulate a letter in my head to send back in response. I haven’t found the exact wording yet, but when I do, I might share it here. I’m not sure what the next email will bring… perhaps an invitation to another dinner or maybe a chance to win a potato from Michelle’s White House garden. I’d be happier to just hear a solid plan for the future. 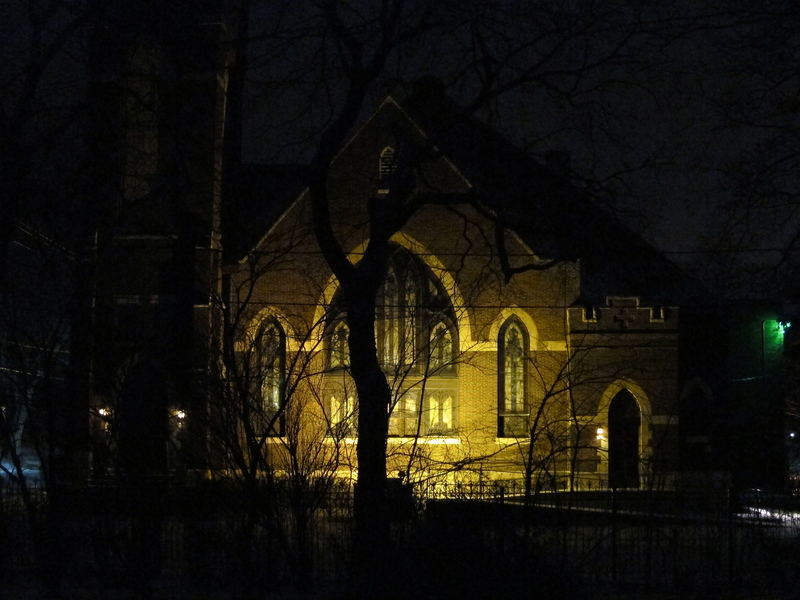 Today’s Pic of the Day: The church next door. I’m not sure it translates well in in this photo– I love this peaceful image I get to enjoy, just outside my door. By jlinamen1229 in Uncategorized on January 19, 2012 . I love the pic! and funny you should write this tonight too! I got a robocall tonight from the republican party and I don’t know why! I’ve never voted republican in 20 years of voting! And, while I was listening to that call, another call came in from the same number! Weird!